Lights up on ANNIE and BEATRICE. They are staring at a work of art in an art gallery. I feel so . . .
My god! My god! My god! . . . Who knew this was possible? When were you in a Lamborghini? The faster – the better – right? Ride it . . . you’ve never been to Japan, have you? Really? A cold is common. Not this. Definitely not this.
. . . is now part of the universe . . . a month ago — this space was empty and now look. Look. More. Did you ever even have one? You want to know something? It’s no longer feeling like a Japanese bullet train — it’s now more like Amtrak. Then you’ve definitely had enough. BEATRICE pulls her away from the artwork. You mean like flossing his teeth eighteen times a day? I don’t like to badmouth him. Pun intended. Good riddance. You lucked out. Yeah, but that didn’t stop you. You were brave enough to let him go. You didn’t cling. Clinging is so pathetic. We’re not socks. And you realized that. Of course you did. Look at the big picture. Simon went on to marry his dental hygienist. They deserve each other. You deserve more than clean teeth. What are you talking about? I’ve never seen you look better. Stop it . . . Here it is. They stop to view the work of art. Then you’re not feeling it. Let’s give it some time. Maybe it’s me. What do you feel? I don’t want to influence you. Darling — you’re ready. So ready. Anything? Do you want to go back and see the first one again? Do you want it the same? Then why did you insist on coming? Exactly. Try one more –- come on you can do it –- I promise this will be the last one. They move on to view the next work of art. Naturally –- the air is very thin up there. That’s wonderful! You’re totally connected. You did take your blood pressure pills —- right? The hell with the pills! Let my pressure jump to 300. I don’t care. I’m alive –- ALIVE — maybe for the first time. To hell with all the doctors – they just want to make you hostage to the pharmaceuticals – one drug – then another – this is the only drug I need! Yes. And it’s beaming bright. This work is heaven. Pure heaven! Look at it. Look deep. Feel it. It’s everything you could ever want — it’s right there — grabbing you – pulling you inside – like a spider entangling you in its web –- deeper and deeper. You’re right! It does have everything. A Black Hole devouring the infinity of space . . . How did I miss it? My head is spinning . . . spinning . . . spinning . . .
BEATRICE keeps looking at the work of art with a beautiful smile as the lights go down. Born in Gibraltar and raised in Queens, MENY BERIRO has utilized his wide array of experiences to create over twenty plays produced Off Broadway and in regional theaters. He is the recipient of the Jean Dalrymple and Gilbert Ancowitz Playwriting awards (American Theatre of Actors) for PigeonHole and Settle Down. Meny was part of a group of playwrights who wrote 167 Tongues, a series of vignettes portraying the multi-cultural life of Jackson Heights which was featured in the New York Times and American Theatre magazine. His play, “Excellent Souls,” about a family dealing with schizophrenia, was chosen as the 2014 Yale Drama Series runner-up. 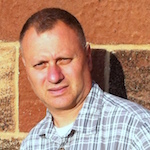 Meny teaches Social Studies at Newtown High School; where he’s developed a Global History Revue with his students covering topics from the Neolithic Revolution to the Renaissance. He is a graduate of Queens College and holds an M.A. in Education from Cambridge College.